DESCRIPTION: This well-presented property sits in a popular area of Tunbridge Wells being close to close mainline rail links, local parks and easy access to the town centre. The accommodation consists of an open plan living area with separate kitchen both overlooking the pretty rear garden. The ground floor also has a good sized bedroom with en-suite, useful for visiting relatives or teenagers. On the first floor are three bedrooms and family bathroom. There is off road parking to the front of the property with its own driveway. SITUATION: The property is set within one of Tunbridge Wells most popular residential locations in light of its close proximity to a wide range of excellent schools including Skinners School and boys and girls Grammar Schools. The nearest main line station is High Brooms approximately under 1 miles distance with its regular and fast services to London Bridge and Charing Cross. Tunbridge Wells main shopping area is approximately 1 mile distance and includes the Royal Victoria Shopping Mall and Calverley Road Precinct where most of the High Street retailers are represented. In the southern part of the town you will find Tunbridge Wells main line station together with the old High Street and historic Pantiles renowned for its selection of wine bars, cafes and restaurants. Recreational facilities include two theatres, local golf, cricket and rugby clubs, St Johns indoor tennis and sports centre, several parks and easy access to nearby villages and open countryside. ENTRANCE: Via double glazed entrance porch with built in cupboard, electricity meter box, tiled floor. OPEN PLAN LIVING AREA: A good sized room including sitting and dining areas. Double glazed window to front, stairs to first floor, laminate flooring, double glazed patio doors to rear, window to side, radiators. KITCHEN: A range of wall and base units with complimentary worktop, double glazed door and window to rear, built in oven with gas hob over and extractor hood above, spaces for fridge/freezer, washing machine and dishwasher, inset one and a half bowl sink and drainer with mixer tap, part tiling to walls, vinyl flooring, radiator. EN-SUITE: Shower cubicle, low level WC, wash hand basin, part tiling to walls, extractor fan, vinyl flooring. FIRST FLOOR LANDING: Loft access which is part boarded with light. Airing cupboard housing pre-lagged hot water tank with shelving and further cupboard above. BEDROOM: A double bedroom with double glazed window to front and side, built in wardrobe, radiator, carpet. 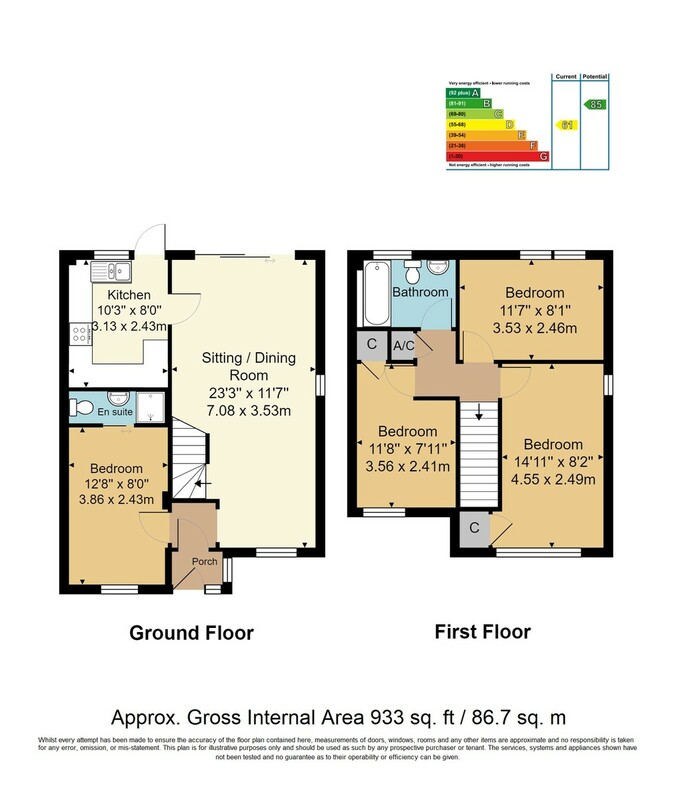 BEDROOM: A further double bedroom with double glazed window to rear, radiator, carpet. BEDROOM: Double bedroom, double glazed window to front, built in wardrobe and cupboard above, radiator, carpet. BATHROOM: A white suite comprising panelled bath, pedestal wash hand basin, low level WC, double glazed window to rear, part tiling to walls, radiator, vinyl flooring. REAR GARDEN: A pretty garden with fencing to boundaries, area of lawn, shrubs to borders, wooden shed, paved patio, gate providing side access. FRONT GARDEN: Area of lawn, shrubs to borders. DRIVEWAY: Block paved driveway providing off road parking .